Just checked out the Safari 4 beta. Overall, it looks promising. Tabbed browsing. The weird tab/title bar doesn’t appeal to me, but I can see its value. To me, the window needs to feel like it’s a container, and the tabs just screw that up for me. But the space savings is nice. Better keyboard navigation. Greatly appreciated by those of us who fill out forms on the web. Which is to say everyone. turns out they had this in Safari 3. Better hints for location bar. Much better! The hints now work kind of like spotlight. Type stuff into the URL bar, and Safari will do its best to find a matching URL from any source it can think of (history, bookmarks, etc). The best guess is shown first (like Spotlight) and the rest are categorized. Problems: The location bar doesn’t seem to handle page titles, which is a shame. Also, if you mistype a URL and get a 404 or other error, it still shows up in history and can end up as the “top hit”. Uh… whoops! Embedded web fonts. It’s great that Safari is doing this. However, to be realistic (a) more browsers need to support this, and (b) someone needs to sort through all the legal issues having to do with font embedding. CSS animations. Back in 97, I was one of the folks working on the first version of Dreamweaver. At that point in time, the Netscape folks were coming up with new tags all the time. When we told the Netscape folks that we were going to add a timeline to Dreamweaver to take advantage of the <layer> tag, they were surprised and happy. You see, the inspiration for the <layer> tag was this question: “how can we have the browser do the things that the Shockwave plugin does?” Fast forward to 2009 and replace “layer” with “CSS animations” or “canvas” and replace “Shockwave” with “Flash”. My opinion on all this? Meh. If you want to do everything that Flash does, use Flash. Or invent something radically new that blows HTML out of the water. Don’t bother bolting that stuff onto HTML/CSS. In fact, if you’re going to bolt stuff onto CSS, focus on getting the basics of static presentation right. CSS layout is still incredibly difficult (way harder than tables were). You have to do hours of Google research just to get a usable two column layout. Top Sites. The top sites UI feels overly glitzy to me, and for no good reason. The slightly curved appearance implies (to my eye) that I should be able to rotate my view to the left and the right to see more sites. Which you can’t do, as far as I can tell. Maybe I’m just thinking about this too abstractly, but it bothers me that so many of the Apple apps are starting to feel the same as each other. Not so long ago, iTunes was different than the Finder, which was different than iPhoto. Now, you have cover flow in the Finder and with Quick Look, you can play the song right from there. So I don’t know. I’m kind of torn. Consistency is nice, but too much consistency leads to every single thing looking exactly the same. It feels a little bit like MS Windows UI right around when XP came out. Tree views were pretty general, and a lot of applications fit into the pattern of “tree view on left, detail view on right”, so that’s what everyone did. Color profile support. They claim to be the first only one to support this, but doesn’t Firefox already do this? Is the issue that it is turned off by default? Or does Safari handle colors in a significantly better way than Firefox? I’ve been keeping more and more information in Google Docs, and it turns out that there is a neat trick to using the service more securely. As it turns out, Google docs honors https urls, even though it doesn’t force you to use them. I use Firefox for most of my day-to-day browsing, and by doing the following, it was easy for me to always use the https version of the urls. 1) View your browser history and remove all occurances of google docs. 2) Remove any bookmarks you may have that point to google docs. 3) Type “https://docs.google.com” into your URL bar to visit Google Docs securely. 4) Recreate any bookmarks you may have had to point to the https version of the URL. Everyone uses browsers differently, but the way I get to Google Docs is to type cmd-L to get to the URL bar, and then type “doc” or something like that, at which point I use Firefox’s autocompletion to pick Google Docs. Now that the history has been purged of the non-https versions of the URLs, I always end up visiting the site through a secure protocol. By going over https, all the data that moves back and forth between the browser and the Google server is encrypted. That means that the content of my documents, spreadsheets, etc., can’t be viewed by someone snooping on the wifi transmission, or anywhere else on the network. Is this paranoid? Sure. Does this make Google Docs secure enough to store highly sensitive information? Probably not. But this trick only took five minutes to do, and now there is one less way for people to snoop on my sensitive information, so I consider that a win. While designing Notespark, we did a lot of UI mockups. As it turns out, I prefer using Fireworks for this kind of work over Photoshop, because it’s easier to manipulate objects on the screen. After doing some Google searching, it appeared there weren’t any good templates for doing iPhone mockups, so we built our own. The toolkit is fairly complete now, so we’re sharing it with the world. 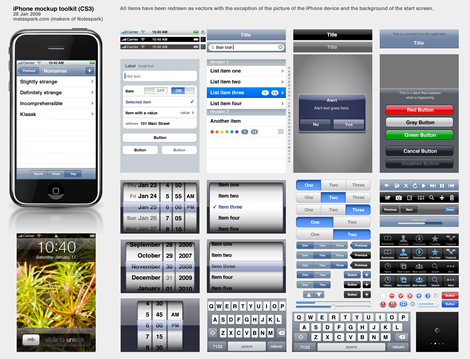 You can use it to create your own mockups of iPhone apps. All items in the file have been redrawn as vectors for easy editing. You can read more about it and download it at the post on Blogspark. You are currently browsing the kuwamoto.org weblog archives for February, 2009.